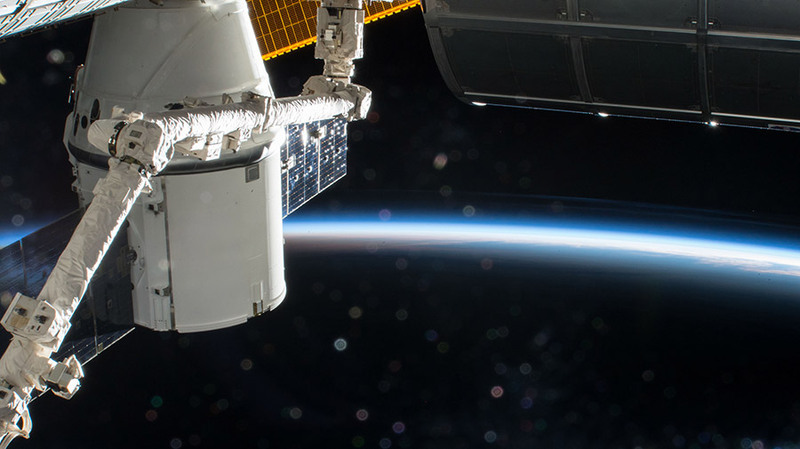 The SpaceX Dragon is pictured with the Canadarm2 robotic arm in the foreground and the Earth’s limb in the background as the International Space Station soars into an orbital sunrise during Expedition 54. Robotics controllers have completed the science cargo transfers from the rear of the SpaceX Dragon cargo ship, also known as its trunk. Dragon is due to depart the International Space Station Jan. 13 and return to Earth. Over the holidays, the ground robotics teams remotely operated the Canadarm2 to remove a pair of new external experiments from Dragon and install them on the station. The teams also finished installing an older experiment back inside the cargo craft’s trunk in time for its departure. Dragon delivered the Total and Spectral Solar Irradiance Sensor (TSIS-1) and the Space Debris Sensor (SDS) when it arrived on Dec. 17, 2017. TSIS-1 was attached to an External Logistics Carrier on the port solar alpha rotary joint. It will study the sun’s natural influence on the Earth’s ozone layer, atmospheric circulation, clouds, and ecosystems. The SDS was installed outside the Columbus lab module where it will directly measure the orbital debris environment around the space station for two to three years. The successful RapidScat experiment was installed back in Dragon’s trunk after being delivered in September 23, 2014, on the SpaceX CRS-4 mission. RapidScat observed wind patterns on the ocean’s surface providing agencies better data for weather forecasting before ending its mission in August of 2016. RapidScat will be destroyed inside Dragon’s trunk when it separates from the Dragon resupply ship to burn up over the Pacific Ocean. Dragon itself will safely parachute to a splashdown in the Pacific Ocean off the southern coast of California. Does DNA change in orbit?